Living history — the picturesque neighborhood of Beacon Hill is a designated National Historic Landmark and home to the gilded-dome Massachusetts State House. 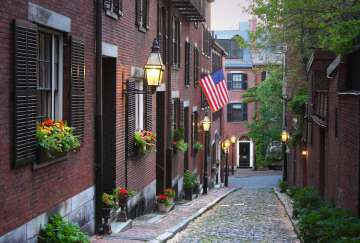 Narrow cobblestone, gas lamp lit streets are lined with ornate Federal-style row houses that are home to the elite, wealthy residents of Boston. During an afternoon stroll through the quaint streets of Beacon Hill, you’ll come across antique shops and boutiques, intermixed with high end restaurants and cafes. Though centrally located in Boston, the lush greenery in Beacon Hill will make you forget the hustle and bustle of the city.